We used Funding Xchange to shop around and find the best deal, rather than be forced to take a finance package that wouldn’t have worked for us. 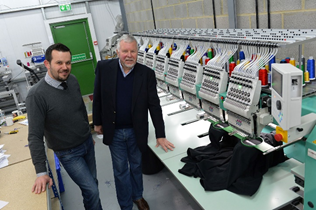 Trevor King and his son John, the Managing Director, received £20,000 via a secured business loan to purchase a production machine. It helped them improve the production process and become more competitive, successfully completing large orders from big companies. T King Associates was founded in 1990. From a small garden shed, all the way up to a large unit on an industrial estate, Trevor and his family have been providing companies with all types of embroidered and printed workwear and gifts, from polo shirts and t-shirts to corporate umbrellas and diaries..
Trevor had a frank discussion with his son – they needed to be competitive in the market for embroidered and printed t-shirts. They were looking at orders of over 1,000 units and the existing machinery was too old and was not fast enough producing garments for customers. They were keen to upgrade their equipment. T King Associates decided on a Secured Business Loan. A Secured Business Loan was ideal for Trevor. It’s popular among manufactures and companies in production as it allows you to draw funds against an asset such as machinery; you can also use property for example. It’s arranged for a fixed period, typically over the expected life-span of the asset used to secure the loan and most lenders will offer to lend up to 80-100% of the value of the asset. In T King Associates case, they could use Macquarie to directly purchase the equipment needed, repaying over an agreed time and taking the pressure off - allowing him to focus on getting those t-shirts printed! Trevor and John received a £20,000 secured business loan from our lending partner, Macquarie. They’re able to finance equipment from a single provider regardless of the type or manufacturer, financing everything from desktop PCs to forklifts. Macquarie’s underwriting model looks at businesses in a way that’s unlike standard asset financiers. Through their equipment lease offering, Macquarie analyse how necessary the asset is that the business owner needs to help the business achieve its goals. They aim to get a decision back to a business within four hours. Learn more about our lending partner, Macquarie. What was the Result for Trevor and Johns Business? "You typically have to finance machinery every five years or so and we were running out of time. Funding Xchange was great – we had already seen other lenders provide the same type of finance but at much higher rates. Funding Xchange showed us all the options – it was quick and simple to apply. The product from Macquarie was good value and that’s ultimately what we were looking for. It was a no-brainer." Ready to move forward on your secured business loan?